The Global Value Chain Development Report 2017, published by the World Bank, the World Trade Organization, and other partners, analyzes recent trends around global value chains (GVCs) and their impact on international trade and development. According to the report, GVCs—defined as production processes in which different countries participate in carrying out different stages of production—account for approximately two-thirds of global trade in value-added terms. 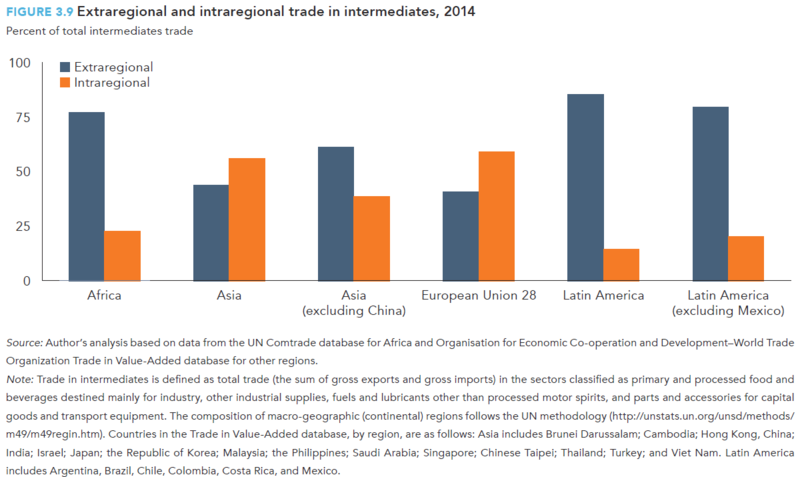 Africa, however, lags behind other regions of the world in integrating into GVCs and, in particular, shows little intraregional integration (as seen in Figure 3.9), the report argues. One indicator of an economy’s integration with the global economy is the percent of foreign value added in the country’s exports. Figure 7.4 from the report compares the percent of imported value added in exports of sub-Saharan African, eight comparator countries, and country group composites. For advanced economies, the foreign value added in exports rose from an average of 25 percent (from 1991 to 1995) to 33 percent (from 2008 to 2012). The average for low-income developing countries and emerging markets excluding sub-Saharan Africa also increased slightly from 17 percent (from 1991 to 1995) to 21 percent (from 2008 to 2012). 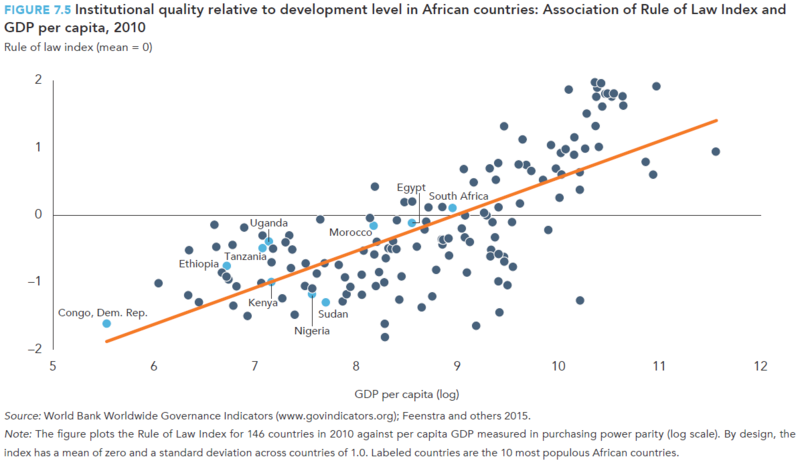 About one-third of African countries performed worse in their 2008 to 2012 average than their 1991 to 1995 average, suggesting a decrease in the GVC integration of these countries between the two periods. Meanwhile, roughly two-thirds of African countries fall below the developing countries average from 2008 to 2012, as seen in Figure 7.4. 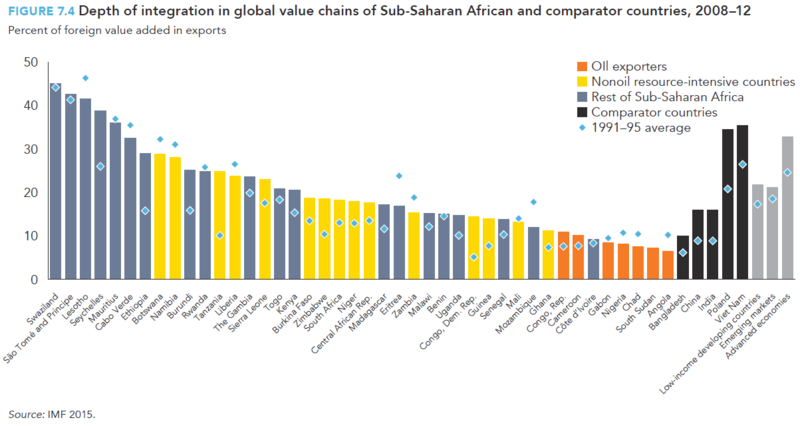 African oil exporters (Republic of the Congo, Cameroon, Gabon, Nigeria, Chad, South Sudan, and Angola) have almost no foreign value added in their exports and fare worse than non-oil resource-intensive countries (e.g., Ghana, Mali, and Guinea, among others). One explanation for this phenomenon is “Dutch disease,” wherein resource exporters have high wages and appreciated exchange rates that make it difficult for them to diversify exports. Interestingly, the top five countries are neither oil exporters nor non-oil resource-intensive countries, and are predominantly countries with smaller populations (e.g., Swaziland, São Tomé and Príncipe, Lesotho, Seychelles, and Mauritius). Figure 7.5 above plots GDP per capita against the World Bank’s Rule of Law index, which “captures perceptions of the extent to which agents have confidence in and abide by the rules of society, and in particular the quality of contract enforcement, property rights, the police, and the courts, as well as the likelihood of crime and violence.” There is a positive correlation between GDP per capita and the quality of economic institutions, as seen by the regression line. Countries that fall above the regression line have unexpectedly good institutions for their level of economic development, and countries below the line have unexpectedly poor institutions given their development levels. The report says that African countries have relatively low GDP per capita and have weak institutions: Indeed, only six African countries reach or are above the Rule of Law index’s global average. Chapter seven of the report concludes that African economies on average have weak institutions (e.g., property rights and rule of law), and neighbors with weak institutions, which may contribute to their small role in GVCs.